Hundreds of peaceful protesters have been arrested, assaulted and dehumanized. People, horses and journalists are being shot by rubber bullets and attacked by private security dogs for being completely peaceful. Protesters are reporting being arrested and held in dog cages and disturbingly, the police have not denied this. The Dakota Access Pipeline is a massive $3.8B project that would carry around 470,000 barrels every day of crude oil from North Dakota to Illinois. It was originally supposed to pass by the state's capital of Bismarck. The plan was then changed to move it away from the city and through Native American land. The pipeline is funded by the usual big business, big profit, big self-satisfied elite who can get away with this because indigenous people are historically considered poor and expendable. Not only is the pipeline been being built on lands it is not allowed to, and against court orders, but it has also brought in private security and militarized police. This move represents what is wrong and it validates what the indigenous people are saying. If the pipeline were safe, there would have been no issue running it through a heavily populated area. But instead of re-considering whether it should be built at all, it seems it is perfectly acceptable to transfer the risks, disruption and potential environmental disasters by running it through indigenous land. And the militarized police have used their armored trucks and high-powered weaponry to carry out cowardly, callous attacks literally on behalf of private corporations instead of doing the job they were hired to do. The way some media are spinning things is by implying the protesters are aggressive and that use of force has been required by police to defend themselves. We have not seen one video, picture or credible report of this but we have seen a lot of police attacking unarmed people and even one armed "protester" who it turns out worked for the pipeline. 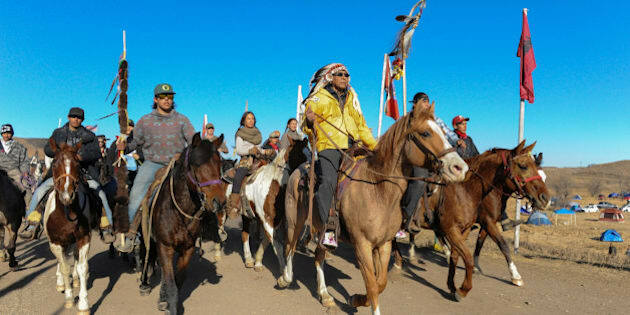 For people not directly involved in the situation, there may not be much concern or empathy for the Sioux tribe of Standing Rock when they talk about the pipeline disturbing ancestral burial sites among other things on land that is rightfully theirs according to treaties. •	Poor people do not matter when big money and big business is at stake. •	People get beaten down, literally and figuratively, when they dare to ask their government to honour treaties (and this could also be contracts, court orders and other legal requirements) or to think long term about the care and safety of water, which we all have a right to. •	The impact on citizens of mobilized, militarized police to defend big business, particularly when big business is on the wrong side of law, treaties, etc, is frightening and reflects the incredible power imbalance. •	This pipeline represents no real benefit to the American public. There is no need for it. •	The pipeline is slated to cross the Missouri River which is a water source 17 million people rely on. I am usually of the position that a peaceful protest is rarely effective; it clearly hasn't worked for indigenous people for hundreds of years. The Dakota Access protest however gives the world, one more time, a view though that many will continue defend their beliefs and rights in this way. President Obama said he would "let things play out" which in political talk means he is not going to do anything and that is extremely disappointing as the least he could do is ask for an environmental review. The United Nations is investigating the treatment of the protesters. While I don't have a lot of faith in the UN or their effectiveness historically with Indigenous issues, at least they are paying attention. But nothing will change until the governments of both the United States and Canada honour their constitutional, legal and ethical commitments to indigenous people, until governments work on behalf of the people of the countries rather than their own political ends and until people remove their money and business from the banks that are behind these projects. And while I encourage outrage by all for the bigger issues represented here, there should be specific outrage that Indigenous communities continue to suffer the effects of abuse, cultural genocide, a suicide epidemic, impoverished communities, a housing crisis, and lack of access to food and healthcare. There can be nothing clearer that Indigenous people do not matter to those in power than the continued situation at the Dakota Access pipeline. Yet it's worth noting that it is the most underrepresented and the most excluded from power who are the ones with enough heart to stand up and say this is not right.